Fortegra Foundation is committed to giving back to the communities that support us by lending a helping hand to those in need and by caring for children and families where we live and work. We work directly in communities across the nation as well as support like-minded charities. Helping our community is where our heart is. 1. Holiday Bikes and Turkeys. 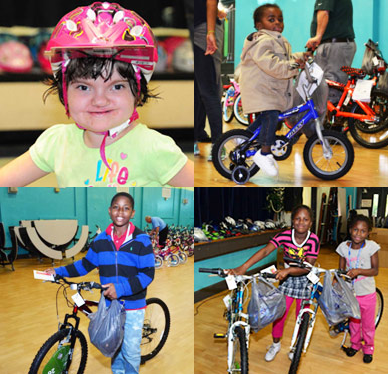 Each year the Fortegra Foundation's Holiday Bikes and Turkeys initiative provides bikes and turkeys for those in need. Our community has been great to us, and this is one small way for us to give back. Get involved! If you'd like to help out with this program let us know by contacting whereourheartis@fortegra.com. The Angel Fund was established to assist associates who are experiencing an unexpected event that is beyond their control. The Angel Fund provides a way to support fellow associates who are experiencing a financial hardship resulting from a sudden, severe, overwhelming and unexpected event - whether a qualified disaster or an emergency hardship, which results in an inability to provide basic life necessities. Associate requests for assistance from the Angel Fund of the Foundation must be submitted through the Foundation's written application. Those requests meeting the Foundation's specific guidelines will be considered for a grant from the Foundation. For more information or if you need help contact whereourheartis@fortegra.com. There are many great charities to which the Fortegra Foundation can contribute. One of the Fortegra Foundation's stated goals is to begin engaging with eligible charities that align with our mission. Our Charity Outreach initiative is a simple way to help raise donations or awareness for already established, eligible charities. If you know of a local non-profit charity that you think is a worthy cause, please let us know by contacting whereourheartis@fortegra.com. If you know of a program or service that you think we might be interested in, please contact us through one of the options below. It's Where our heart is. Fortegra Foundation is a Delaware nonprofit corporation and a registered 501(c)(3) tax-exempt organization headquartered in Jacksonville, FL. To learn more about what we do, see our About The Foundation section. Is there a minimum online donation amount? Yes, but that minimum online donation is an affordable ten dollars. And, of course, we accept donations of any amount above the minimum. All donations made to Fortegra Foundation are not refundable. If you have any problems or questions, please email us, and we will help resolve the problem. Is my donation 100% tax deductible? All donations on our site are tax-exempt and your donation is fully deductible to the full amount allowed by law. Please consult your tax advisor regarding specific questions about your donation. Florida: A copy of the official registration and financial information may be obtained from the Division of Consumer Services by calling toll-free (800-435-7352) within the State. Registration does not imply endorsement, approval, or recommendation by the State. Fortegra Foundation's registration number is CH38781.